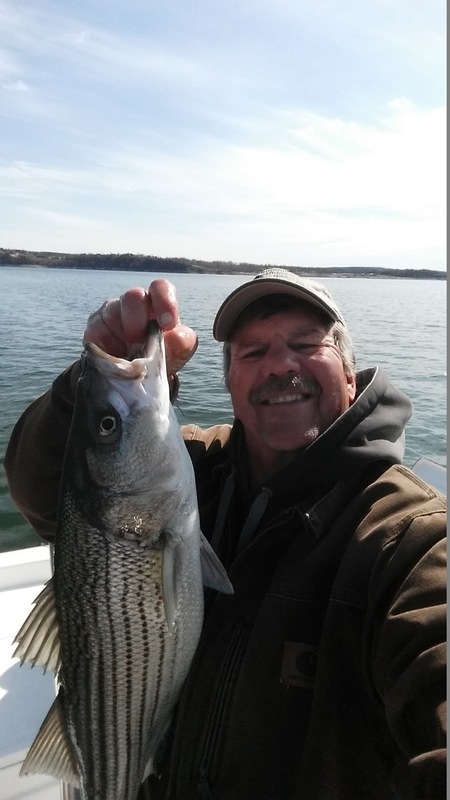 Fish on Norfork Lake are in transition from their winter pattern to an early spring pattern. Yes, this is very early, due to an abnormally warm winter which has kept the water temperature warmer than normal. The surface water temperature is 5 - 8 degrees warmer than the last 3 years at this time. The bait fish have started to move into shallow water which in turn makes the predators follow suit. 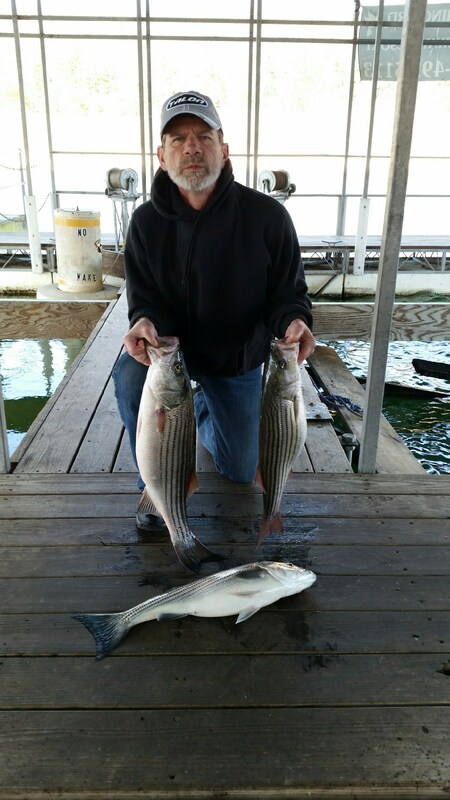 Striped bass can be found at all different depths. This morning I located a couple large schools of striped bass still out in 65 feet of water, following shad that was 50 feet down. Last weekend a couple of my Facebook followers (father and son) took my advice and headed back into a major creek and found some nice fish on the bottom in 35 - 40 feet of water, again chasing the bait fish. 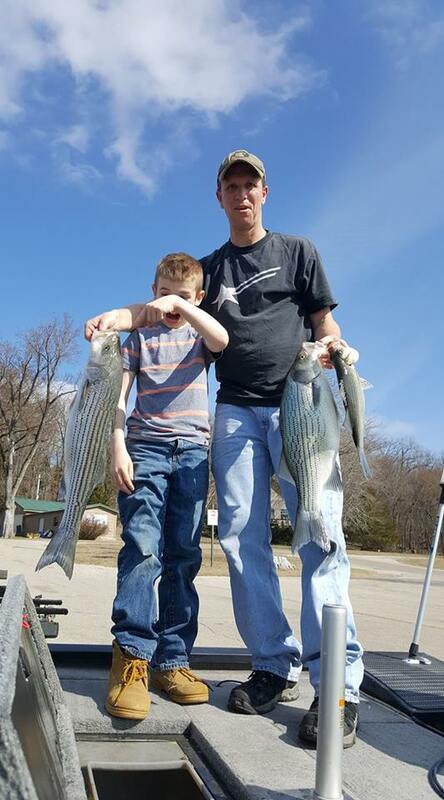 As the water continues to warm, the majority of the bait will move out of the deep water into shallow water which will make for a great spring bite. 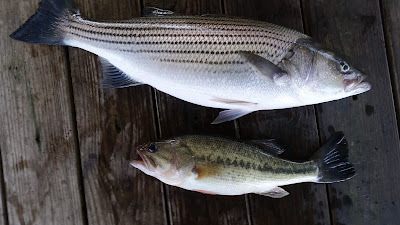 Assuming the weather pattern holds as is, we are due for a very early spring bite, but this is a very big assumption. Only mother nature will control what happens with our weather. I have started to see small signs of top water feeding fish, not much but it's still encouraging. Don't get your hopes up too much because this is really early for top water action. 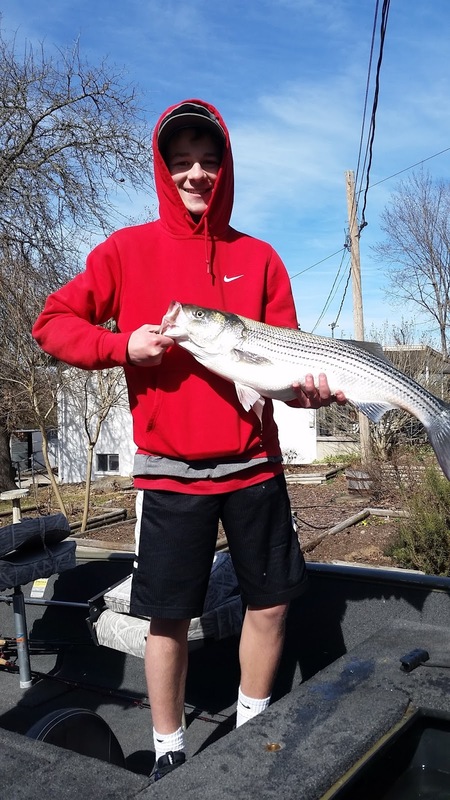 The best place to look for striped bass is halfway back in the major creeks. 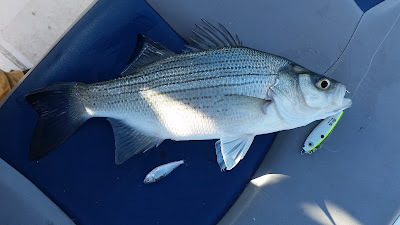 Live bait and vertical jigging a spoon have been my best way of catching stripers, but throwing stick baits and flukes at sunrise are starting to work. I have only fished after dark for striped bass once since my last report with little success. The water temperature is just right for the night bite to start, so I will be out more and more after dark here real soon. White bass are moving back into the major creeks on their annual spawning run. Start looking for big females staging in 30 - 45 feet of water. The males are the first to move into the creeks and then the females will follow. Once they start their spawn you will find them close to the banks. Small spinners, blade baits and spoons are some of my favorites baits for the white bass. Largemouth bass are also starting to move into shallower water. This morning I was live bait fishing for striped bass and moving slowly along a deep bluff line. I found a small cut in the rocks and started casting my Kastmaster to the shore and letting it sink about 10 feet. I ended up landing 5 largemouth out of this little pocket. They are getting very aggressive. Crank baits will be working, as well as spinner baits on those wind blown banks. The Norfork Lake water level is currently at 546.92 with minimal power generation at this time. The lake surface water temperature was 53 degrees this morning and is rising slowly. The main lake as well as parts of the creeks and coves are clearing. Once you get half way back into the major creeks the water is stained making it great for fishing.